This quick stove top entrée comes together fast and is beautiful enough for a dinner party or a special dinner at home. 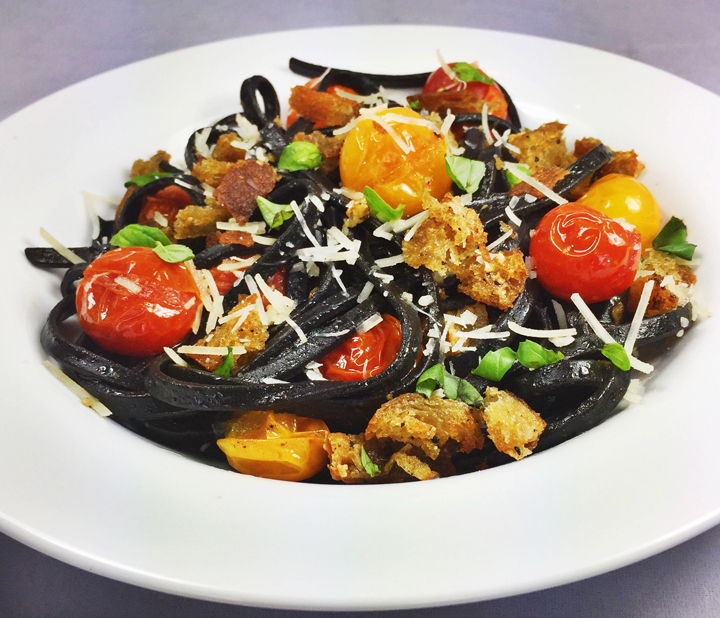 Fresh, sweet cherry tomatoes are pan-seared and caramelized, then mixed with squid ink pasta, deliciously flavored bread crumbs, Parmesan cheese, and topped with fresh basil. Pasta with squid ink tastes like pasta (no fishy flavor) but makes a stunning presentation with the colorful tomatoes and basil. You can purchase it at your local Williams-Sonoma store or on Amazon. Start a large pot of water to boil; add a handful of salt. Cut the ciabatta bread into a few very thin slices and tear the slices into small pieces. Repeat until you have 2 cups. Heat a 12” sauté pan over medium heat, add ¼ cup of olive oil. Add the cherry tomatoes and a large pinch of salt. Cook, shaking the pan often until the tomatoes are blistered all over and just starting to pop. Pour the tomatoes into a bowl, cover, and keep warm. Place the pan back over the heat and add ½ cup of olive oil and the red pepper flakes stir with a wooden spoon to loosen any bits stuck to the bottom of the pan and until the pepper flakes are sizzling about 3 minutes. Add the anchovy paste and stir to dissolve into the oil. Add the breadcrumbs, and cook, stirring often, until the crumbs are deep golden, about 2-3 minutes. Add the garlic and cook, stirring, until the breadcrumbs are crisp and brown, 1 minute longer. Remove from the heat and place ½ the toasted breadcrumbs to a bowl or plate; set aside. Set the sauté pan aside with the remaining crumbs. Cook the pasta according to package directions until al dente. Reserve 1 cup of the cooking water and drain the pasta. Return the sauté pan to medium heat and add the pasta and ½ cup of pasta water to the remaining half of the breadcrumb mixture, tossing to combine. Scrape the bottom of the pan to dissolve any remaining bits sticking to the bottom of the pan. Stir in the Parmesan cheese, reserved cherry tomatoes, and ½ the fresh basil. Add any extra pasta water if needed. Season to taste with salt. Place the pasta in 4 warmed bowls and sprinkle with the remaining breadcrumbs and basil. Serve with Parmesan cheese for passing. Makes 4 servings.